Every once in a while, I get on a kick where I just want to read and watch horror movies. There’s something exciting about being scared sometimes, especially when you know you’re really safe on your couch. 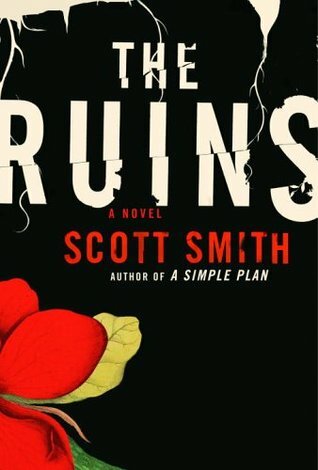 One horror novel that I really enjoyed recently was The Ruins by Scott B. Smith. The general plot of this book is that a group of travelers who are exploring the Mexican jungle find themselves at the mercy of some very dangerous ancient plants. I don’t want to give too much else away about the plot in order to avoid spoilers, but I definitely enjoyed trying to figure out exactly what was going on. I can’t say that any of the characters really stood out to me. This one is definitely more focused on plot than character, but it was still a really exciting read, and it moved very quickly. The atmosphere is consistently creepy and the plot is not as predictable as many horror novels. I also really loved the setting of the Mexican jungle. It was exotic and much different than a lot of horror novel settings which rely heavily on cliches. I haven’t read any other books by Scott B. Smith, but I’d definitely love to read another one to see if it is just as good as this one. Also, for those who may have seen the movie based on this book, I can assure you that the book is MUCH better!